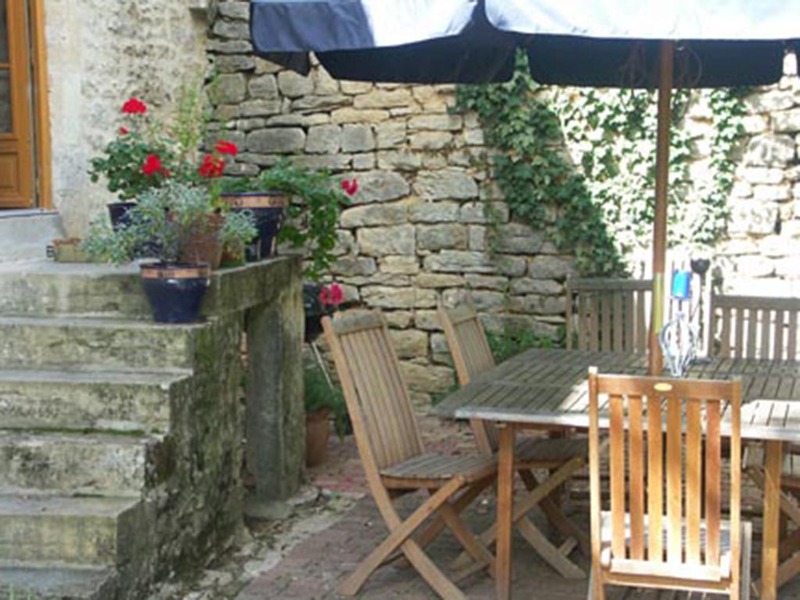 The hamlet where this house is located is set out in a farmhouse style with another cottages facing a central courtyard. 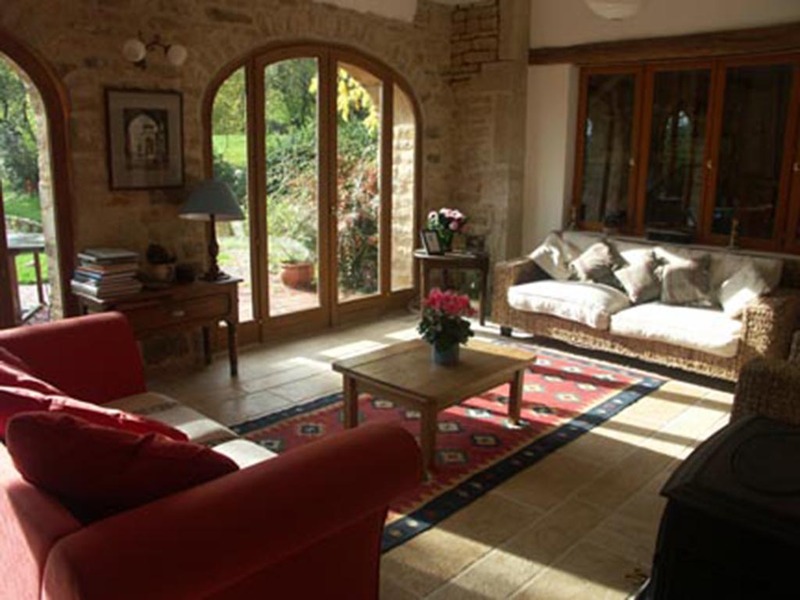 This house has been converted into a lovely home which sleeps 8 people very comfortably. Although there are two other houses in the hamlet this home is entirely independent and private, although they share a large swimming pool. The house comprises 4 bedrooms and three bathrooms. The main bedroom on the first floor, has a bed measuring 2m x 2m and from this room there is a balcony overlooking the valley, with table and chairs. 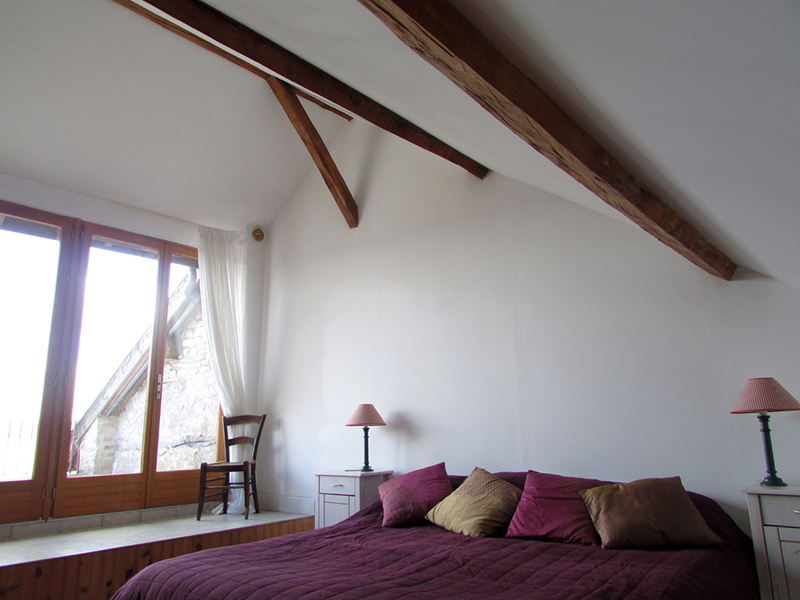 There are two low main oak beams, one on accessing the room and the other on accessing the bedroom area. It has its own bathroom with deep bath, large shower, bidet, wc and sink and the floor and walls are decorated with local limestone tiling. 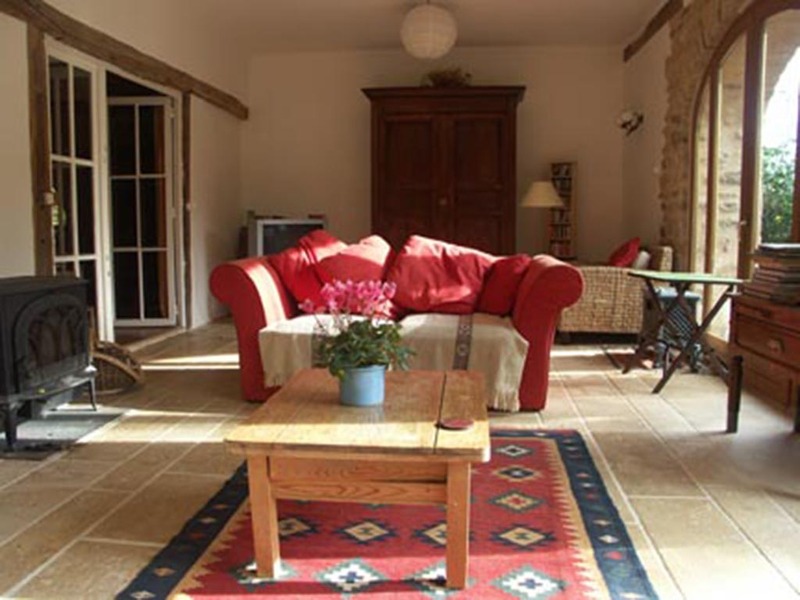 There is a high ceiling showing the original barn beams and off the bedroom is a large dressing area with sofa and large wardrobe, and has views to the front and back of the house. On the first floor is also a small bedroom overlooking the front of the house, with twin bunk beds and another double bedroom overlooking the back of the house, with twin beds which can be fitted into a double bed (notice would be needed prior to arrival to organise the bedmaking!). The salon area has two large arched windows overlooking the side of the house and one window overlooking the front. 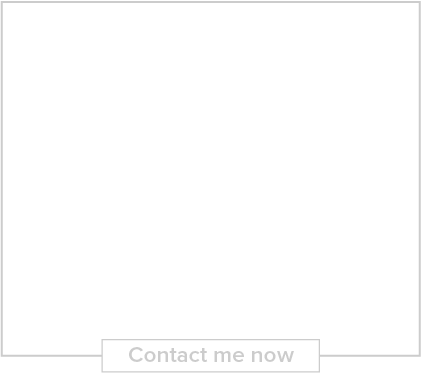 This room measures 8m x 4.50m. There is comfortable seating and a large Burgundian armoire which houses the stereo machine with CD player. There are a selection of CD's mainly comprising classical music. There is also a television receiving French satellite channels, BBC Prime and BBC World. Also a DVD and Video machine with a selection of videos and DVD's. There is an open fire and underfloor heating with central heating throughout the house, although this won’t be needed in the summer! There is a large dining room seating 14 comfortably. There is a baby grand piano. Open wood fire. The room has an interesting arched window which dates back to the 17th century. 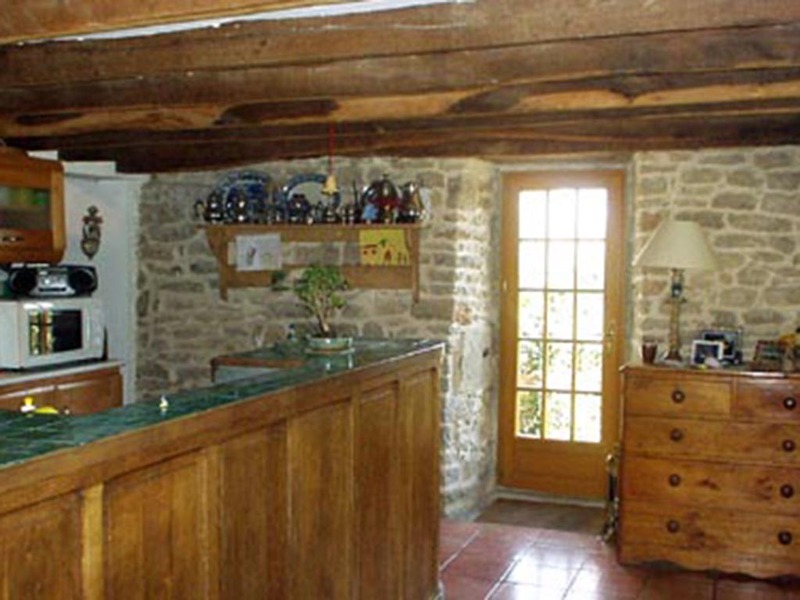 This window has shelves which were used with a stone slab sink, for washing and drying cheese. It has been glazed with one piece of glass and now overlooks the back garden terrace. Access from here leads to the salon. 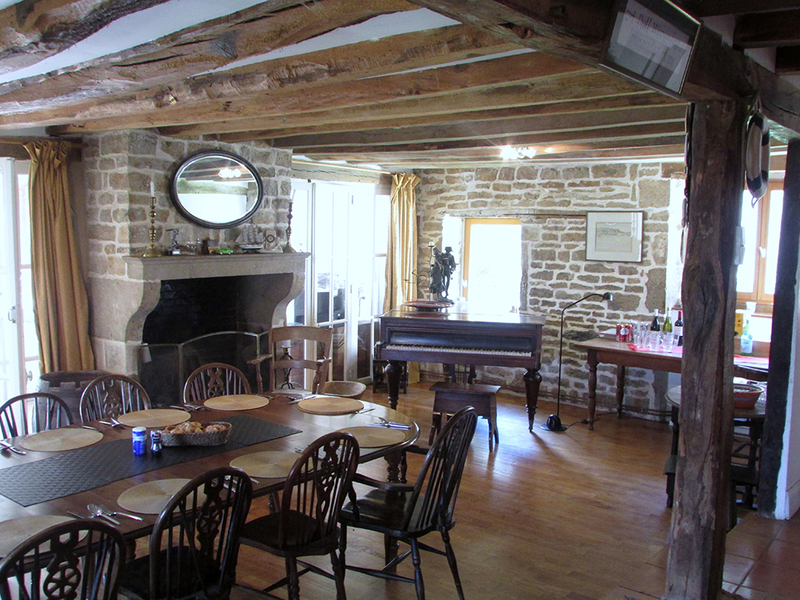 The kitchen is fully and well-equipped to cater for up to 14 people. There is a large "Ambassador" gas cooker and oven; microwave; cafétière; food processor. Also on the ground floor level is a bathroom with shower, sink and WC. Through from the kitchen is a corridor which leads down to the garage where two cars, with manoeuvring, can be parked. There is further parking behind the changing rooms, poolside. Also from this corridor up 3 steps is another bathroom with shower, sink and WC. Next to this bathroom is another double bedroom with double bed. Opposite the bathroom is the laundry room. 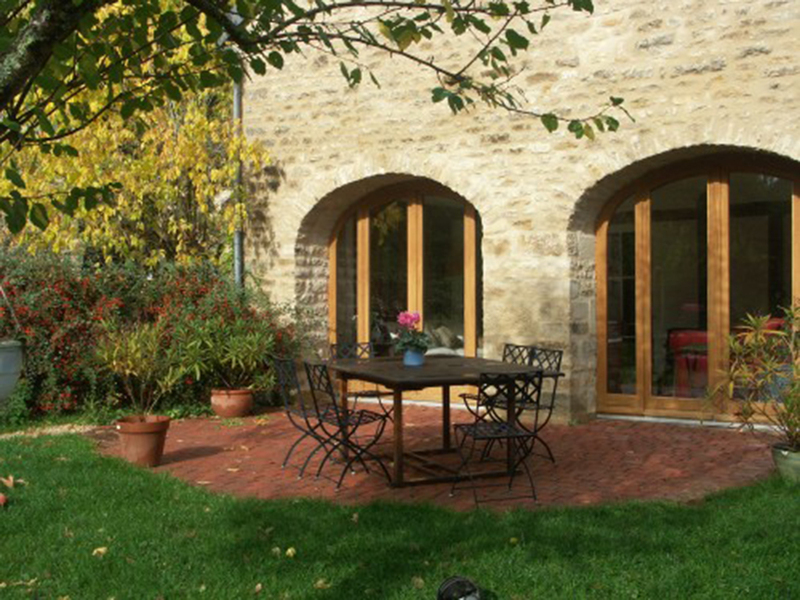 Clients have the use of the garden on two sides of the house, one of which is accessed from the arched windows off the salon and the other, from the kitchen to the terrace. 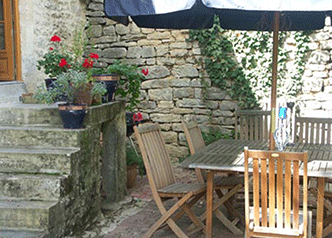 This terrace has garden tables and chairs. There is a "hot-tub" which can be heated from the woodburning stove or just left to dip into when the going gets too hot! It's great fun at night to sit in it and watch the stars! This hot-tub is for the exclusive use of clients staying in L'Ecurie. 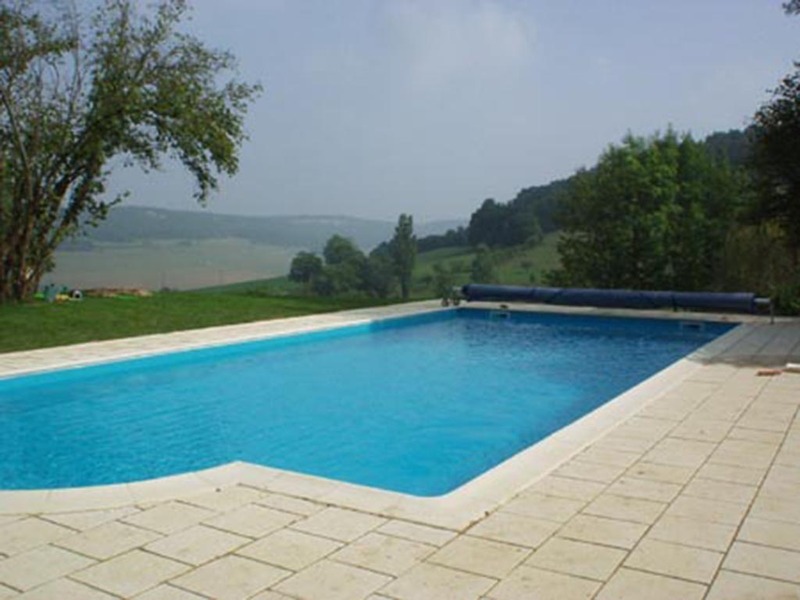 The swimming pool is shared with the other two houses in the hamlet. 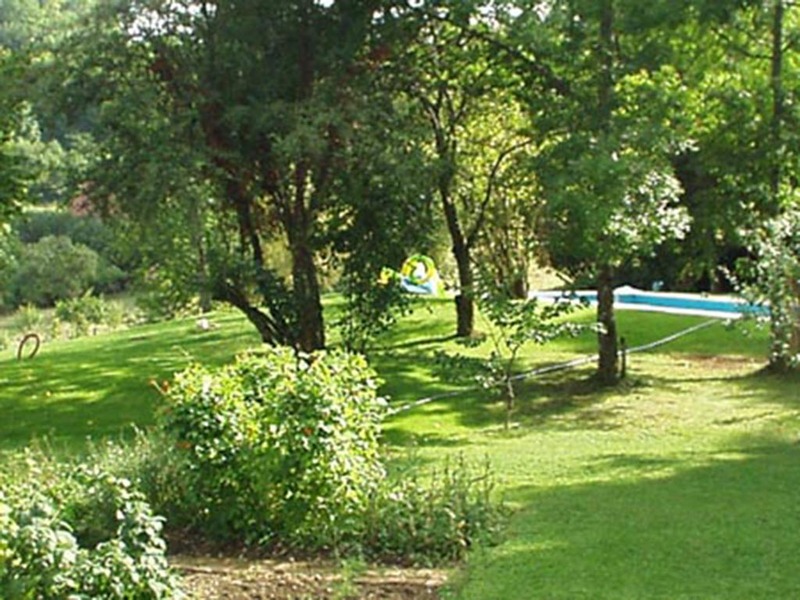 The pool is set away from all the houses thereby providing a reasonable amount of privacy for all clients. It is regularly maintained and cleaned. There is an extremely efficient heating system which regulates the temperature to 26°C. The changing rooms also provide a summer kitchen with stove, small fridge and sink. There is a WC, shower, changing area and steam room which is simple to use. There is also a line for drying wet towels and bathing costumes. Poolside furniture is provided. Swimming towels are not provided!